Such chutzpa! (Audacity). Saying that Jerusalem is the eternal city of Islam. Hamas killers are now declaring that Jerusalem is the "Eternal Capital" of the Islamic world. David, King of Israel, ruled from 1010 BCE to 970 BCE, capturing the city in 1010 BCE. Mohammad died in 632 CE, 1,600 years later. Jerusalem is in the Judean Mountains, part of the land of the tribe of Judah which was part of the land of Israel and then the land of Judah. 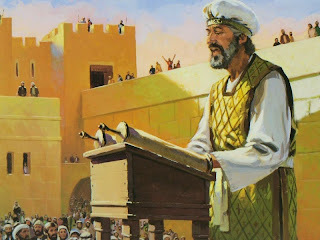 David made Jerusalem the religious center of Israel by transferring the Ark of the Covenant there. His empire reached from the Red Sea to the Euphrates. Religious activities centered in Jerusalem. Jews have been saying that Jerusalem is the eternal capital of Israel! It was King David who built it and used it for his capital. It is Jerusalem that Jews have prayed for 2,000 years to return to in Psalm 137 when they were in Babylon by saying: "O Jerusalem, let my right hand forget its skill. Let my tongue adhere to my palate if I fail to recall you, if I fail to elevate Jerusalem above my foremost joy." Babylon's Nebuchadnezzar had captured Israelites and took them to Babylon in 597 BCE and again in 586 BCE. The Persian, King Cyrus, allowed them to return after 50 years. Romans invaded and their rule was unbearable, causing the Jews to revolt in 66 CE. In 70 Jews saw Jerusalem burned by the invaders and many fled. General Bar Kochba fought the Romans for 3 years from 132 to 135 and Jerusalem was liberated until he was killed in 135. Then it was turned into a Roman colony and Jews were told they could not enter upon pain of death. It then became a Christian city under Constantine. Mohammad died in 632 and by 638 the city fell to the Caliph Omar. No one really loved or cared for the city which was the center of Judaism. In our Jewish Bible (Old Testament) Jerusalem is mentioned 669 times, Zion, which refers to Jerusalem and Land of Israel are mentioned 154 times and this adds up to 823 times. In the Christian Bible, Jerusalem is mentioned 154 times and Zion 7 times. Israelis have said that Jerusalem shall always be undivided. Palestinians notice what works for Jews and then copies it. Too bad they haven't done this in trying to build a more secure state for themselves by making peace with Israel and become workers and not killers. It's like the situation that King Solomon faced when two ladies brought forth one baby and each lady claimed it belonged to her. King Solomon threatened to kill the baby by cutting it in half and giving half to each lady. The real mother, the one who cared, said to give it to the other person. So it was with the Jews and Eretz Israel. When the UN planned to give the Arabs land and decided to cut it into 80% and 20% with the largest piece going to the Arab King Abdullah I, the Jews went along with it to save the land and save their own people. Not so Fatah and Hamas terrorists. They are fighting in every imaginable way to take all the land from the Jews including such lies. Palestine was just a backwash piece of unwanted, weedy, mosquito infested swamp and desert that nobody wanted until the Jews rose up on their high horse and started to develop it when exiled Jews started returning in the 1880s. What were the Arabs doing then? They weren't doing so well and had no ideas about "returning to the land" like the Jews. The land had been under the Ottoman Empire for the past 600 years and this Turkish rule was harsh. The Palestinian peasants' life was already deteriorating because of taxes. Those that owned a bit of land would be forced to borrow money to pay taxes, causing these farmers to put themselves under protection of the very rich bigger landowners or of the Muslim religious endowment fund (Waqf. They were eventually compelled to give up their title to the land. In 1858 there was the Turkish Land Registry Law but until then there were no official deeds giving these fellahs title to land. Their own Muslim culture consisted of blood-feuds between families, clans and entire villages including incursions by Bedouin tribes. So we see with the Muslim that the rich took advantage of the poor and drove them away. By the 1880s when Jews were arriving because they were leaving anti-Semitic lands that were impossible to live in anymore, they bought land from large landowners who were anxious to leave as well and go to real cities such as Paris and Beirut. The amazing thing is that the homes of some of the Arabs had Jewish symbols on them, showing past residents were Jews who had lived there. This anti-Semitic world has not yet recognized Jerusalem as the capital of Israel, though it has been since 1967 when the Six Day War took place and Israel won against immeasurable odds. Then we have the Palestinians who refuse to recognize Israel as a state let alone Israel as its capital. They are getting away with it because the rest of the world is not ready to accept the fact that Jerusalem is the capital and always has remained so. Face it. It's importance has only been to the Jews. Jesus recognized it as the capital, though, and held his Last Supper there. This is the reason Christians are interested in it; for their own religious connection to the city. Muslims have the saga of Muhammad flying there on his horse which they have deemed as the farthest mosque. The religious places of Christians and Muslims are safely guarded by the Israeli government. This has not proved true under their administrations for the Jews. It was c1320 BCE when Joshua entered Canaan. Jerusalem was a watering hole then from the Old Stone Age period (Paleolithic). Foundations date back to 3500-2000 BCE. Old. Yes. Israel sits on ancient land. However, Jews have never left the land nor had they left Jerusalem. "In ancient days, Judaism revolved around the Temple in Jerusalem. The Sanhedrin, which governed the nation, was located in the Temple precincts. The Temple service was at the heart of the Rosh Hashanah and Yom Kippur holiday. 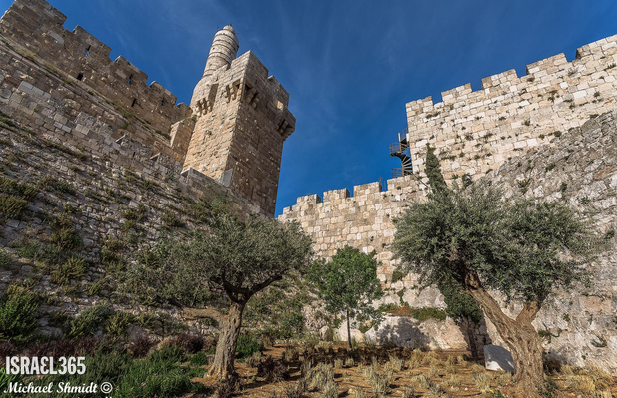 The Temple was central to the Three pilgrim festivals, namely Passover, Shavuot and Sukkot, when all Jews were incumbent to gather in Jerusalem. 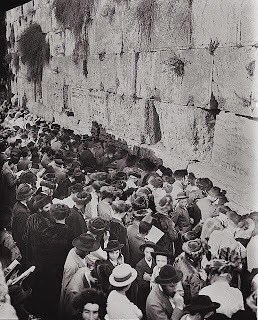 Every seven years all Jews were required to assemble at the Temple for the Hakhel reading. The forty-nine day Counting of the Omer recalls the Omer offering which was offered at the Temple every day between Passover and Shavuot. The eight-day festival of Hanukkah celebrates the rededication of the Second Temple after its desecration by Antiochus IV. A number of fast days including the Ninth of Av, theTenth of Tevet and the Seventeenth of Tammuz, all recall the destruction of the Temple." Tell me: Would the Parisians allow Paris to be in foreign hands and have a name change? Jews lived here in Roman times. Would Americans allow Washington DC to fall into China's hands? 1776 is its birthday. "We must be ready to sacrifice all for our country Israel. For history does not long entrust the care of freedom to the weak or the timid. We must continue to acquire proficiency in defense and display determination and stamina in purpose." Never surrender - we are fighting for our survival and the alternative is extinction.